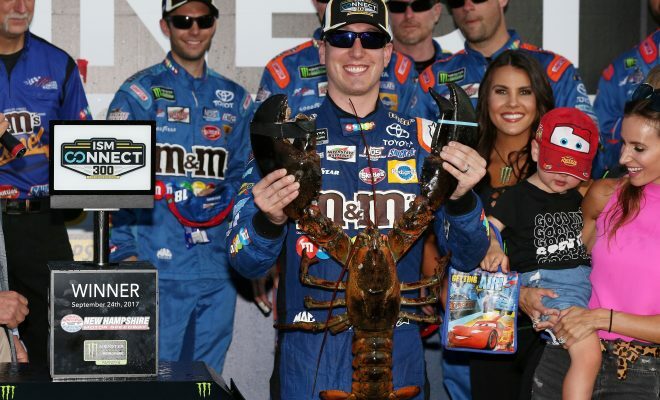 The Monster Energy NASCAR Cup Series is headed to New Hampshire Motor Speedway for the Foxwoods Casino Resort 301 and our Sarah Handy breaks down her picks and who you may want to pay attention to this weekend. Kyle Busch: Some of you may have noticed I’ve been picking Kyle as a top pick to win for the last few weeks. With his numbers, especially at NHMS it’s hard to not have him as a pick whether it’s my feature of a fantasy league. Busch is the defending winner of the September race (which I attended) last fall. If you’re unaware the September race was given to Las Vegas so the MENCS will only race at Loudon in July now. It’s a track that has been very kind to the driver of the No. 18 Toyota Camry for Joe Gibbs Racing. In 26 career cup starts, Busch has 3 wins, 10 top-5’s, 14 top-10’s, led 973 laps and has completed an astounding 98. % of the laps run in cup competition at the Magic Mile. Busch will look to win from the pole as he did in the fall and there’s a very good chance he does go back-to-back in wins on Sunday afternoon. I look for him to win and if he doesn’t I don’t see him finishing outside the top-5. Kevin Harvick: I’ve witnessed both of Harvick’s wins at NHMS in person (Sept. 2006 and Sept. 2016). It’s certainly a track he has run very well at in his MENCS career up to this point and he could battle Ky Busch for the win on Sunday. In 34 starts at The Magic Mile, the 2014 NASCAR Sprint Cup Series Champion has 2 wins, 10 top-5’s, 18 top-10’s, led 706 laps and has won one pole position. Like Busch, with the season Harvick has been having it’s hard to bet against either of these drivers each week. Harvick will look to have a better finish than his disappointing 36th place result last September due to a crash. Austin Dillon: In eight starts at NHMS, Dillon only has one top-10 finish which came in July of 2015 when he finished eighth. Since then his best finish is 13th (July 2016) so I personally feel victory lane is a long shot for the 2018 Daytona 500 Champion. His recent statistics at The Magic Mile show me he will be more than likely to leave Loudon with a top-15 finish. Kurt Busch: The driver of the No. 41 Ford Fusion for Stewart-Hass Racing has three wins at NHMS, but the statistics show you have to go all the way back to June of 2008 for his last victory there. Since then Busch has had some top-10 and top-15 finishes but he’s also had his fair share of bad luck including a 37th place result last September due to an accident. His best finish since his last win at the track is a set of third place finishes which came in June of 2009 and June of 2009, respectively. Kasey Kahne: Kahne’s only win at NHMS came in 2012 but he’s had some good finishes and not so good finishes since then. In 28 starts, he has 1 win, 3 top-5’s, and 10 top-10 finishes. Kahne will look to finish better than his last two trips to NH where he finished 28th and 35th last season. Ryan Newman: NHMS has been a very good track for the driver known as The Rocketman throughout his career in the MENCS. In 32 starts, Newman has a whopping 7 poles at The Magic Mile to go along with 3 wins, 7 top-5’s, 18 top-10’s and 722 laps led. Newman’s last win at the track came all the way back in 2011, but he’s still a driver to keep an eye on with the success he’s seen at the track. Alex Bowman: In his first full-time season with Hendrick Motorsports, Bowman has shown what he can do in good equipment. In 17 starts this season, Bowman has 1 top-5, and 6 top-10 finishes. Bowman is coming off a 14th place result when the MENCS visited NHMS last September. While statistically in his cup career Loudon hasn’t been the best track for Bowman I look for him to have a solid finish being in the equipment he’s in now. Note: Our Sarah Handy will be at New Hampshire Motor Speedway for the NASCAR events held at The Magic Mile this weekend. Stay tuned for content and photos.